I cannot read this man’s expression. He is looking right into my eyes, but I cannot see what he is thinking… If I could see the world through his black eyes, would I understand him better? And suddenly, there’s the connection: black eye-salve, black eyes! The façade of a strange edifice seems to press the two figures up against the picture plane. They are constrained within the confines of a narrow stage, with the bottle of Marmite between them. The patterns that decorate the building are reminiscent of the traditional monochromatic Sotho style, but the gable with its round fanlight is vaguely Cape-Dutch. Will a door open in this blank wall, so that both can go in and live together? Two mielie plants – maize is the staple of Southern Africa – flank the foreground like two spears, and behind the flat backdrop, the signs of the industrial era rise up into a lowering, reddish sky. Dawn or sunset? Which will it be? Will we apply the eye-salve and see one another? 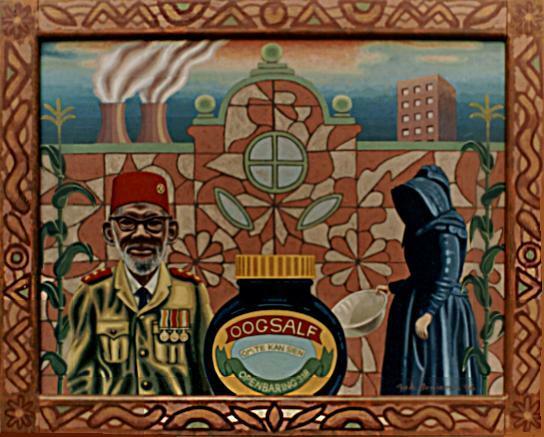 Zak Benjamin: Oogsalf (Eye Ointment), 1996, approx. 67 x 82 cm, acrylic on board. Zak Benjamin: Zak Benjamin, born Izak Benjamin de Villiers in 1951, is a South African painter and printmaker. For more about him and his work, visit www.zakbenjamin.com. Erna Buber-deVilliers: Erna Buber-deVilliers is a retired high school art teacher and is married to artist Zak Benjamin. Biblical quotes: Revelation 3:14-18 & Matthew 5:4 and 6 from The New English Bible, Oxford University Press & Cambridge University Press, 1970.